3.The computer and headphone are not included. It is designed to fit 3/8"" and 5/8"" mounts. With the knob on the stick horizontal, you can change the position as you want. 30.5 inches/77.5 centimeters boom with counterweight, the non-slip feet and tripod base add its stability. 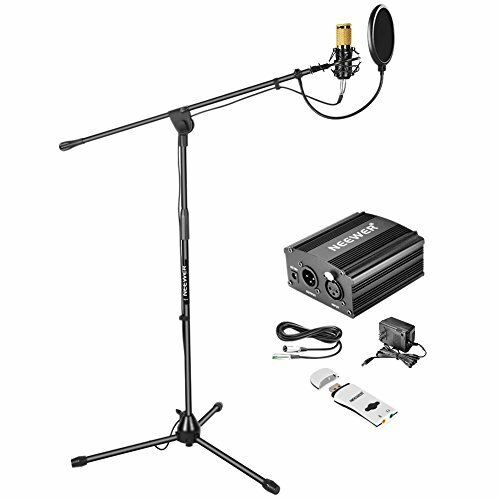 Comes with one XLR audio cable with XLR male and female connectors. It is an easy way to instantly add a headphone and a microphone to almost any USB-enabled PC or laptop. Compatible with standard built-in ""USB Audio"" drivers,such as Windows XP/Vista/7/8/8.1/10/Mac OS.